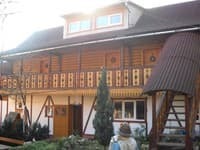 Private Estate "Petr" is situated in the heart of Rachel, a 10-minute walk from the train station. It offers spacious double rooms. Each room has a double bed with orthopedic mattress, a modern flat-screen TV, refrigerator, bathroom. Throughout the cottage free Wi-Fi access. In the courtyard there is a place for car parking. 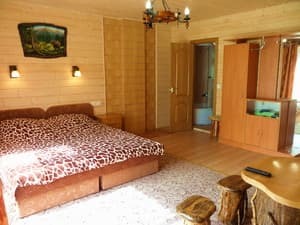 The distance to the nearest shop - 20 meters, to the cafe - 60 m. Manor "Petr" is 2.1 km from the railway station Rakhiv, 1 km from the bus station. Check arrival: from 12:00 - 23:00 hours. Check leaving: to 10:00 - 13:00 hours. Children under 12 years of age without a separate bed are free of charge. By prior agreement is possible to provide extra beds (paid service). 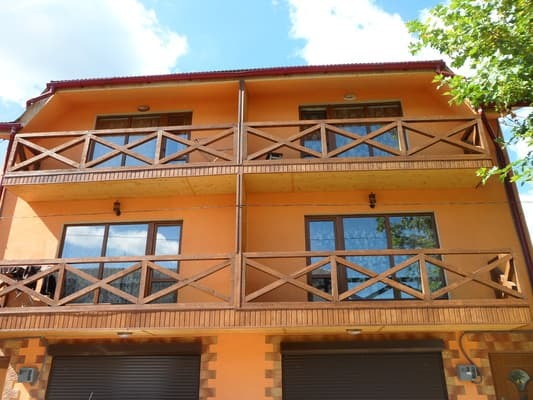 The distance to the nearest shop - 20 meters, to the cafe - 60 m.
Private Estate "Petr" is situated in the heart of Rachel, a 10-minute walk from the train station. Rakhiv railway station is 2.1 km, 1 km from the bus station. By train to the train station in Rakhiv.